I think this was probably my least-favorite issue of SECRET SOCIETY OF SUPER-VILLAINS. Gone was the overarching threat of Darkseid and his minions from Apocalypse, gone were many of the villains that I cared about and was interested in. Instead, what we got was for all intents and purposes an issue of CAPTAIN COMET. And I liked Captain Comet just fine, but this one was underwhelming. 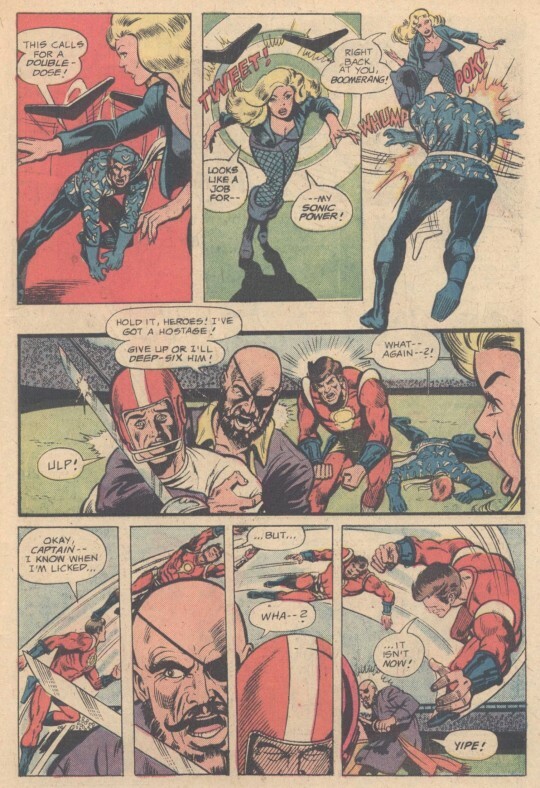 Maybe it was the inclusion of third-stringer Captain Stingaree, I don’t know. The story opens with the launch of a space-boomerang ship. 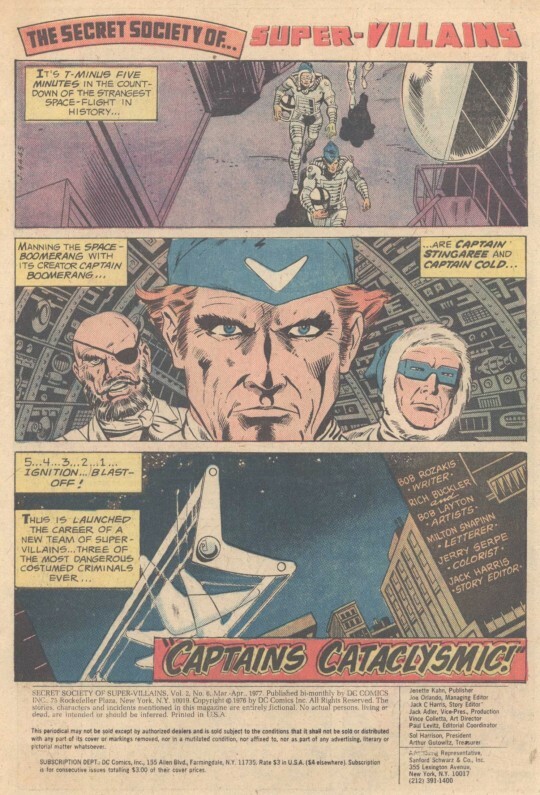 At the helm are Captain Boomerang, Captain Cold, and Captain Stingaree–no idea how the first two hooked up with the last, no clue is given. But they’re on their way to take over a thinly-disguised version of Skylab way up in orbit, for reasons that are somewhat vague. But super-villains, you know, what are you gonna do? Chilling on the Justice League satellite with Hawkman, Captain Comet hears about the invasion of the nearby Space-Lab and flies to the rescue. Hawkman, of course, remains behind on “monitor duty”, that card that was often played in JLA adventures when you wanted to leave a potential guest-star on the bench. Comet tackles the three villainous Captains, but is unable to prevent their escape, taking the commander of the Space-Lab with them. 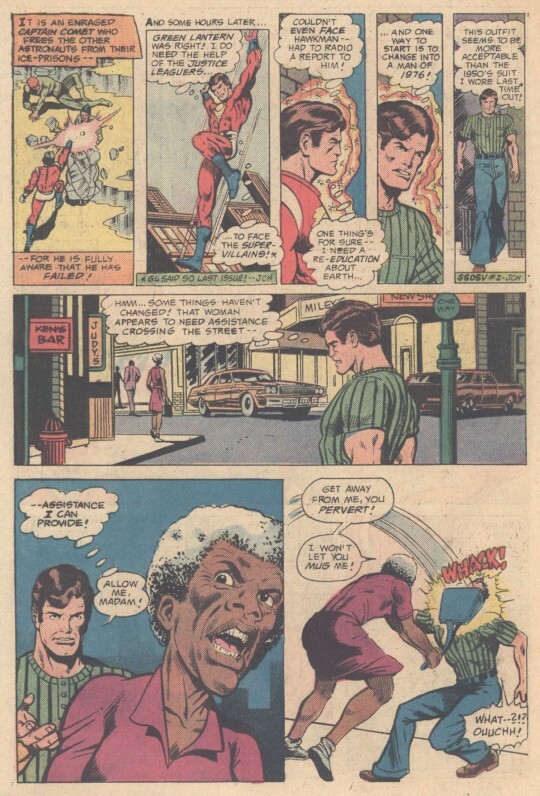 Returning to Earth, a dejected Captain Comet tries to reintegrate into civilian life in his Adam Blake identity, only to be taken for a mugger and clobbered by and old lady, and then picked up by what appears to be a streetwalker named Debbie. Debbie will be a strange character in the coming months, sometimes changing her name to Camille and clearly having a connection with Star Sapphire. But the switches in writers and the demise of the series prevented any of this from truly being explained. The next day, the trio of Captains perform some piracy on the high seas, attacking the S.S. Sunset and making off with her Captain as their captive. These events are recounted on the evening news, where they’re viewed by a number of interested parties. 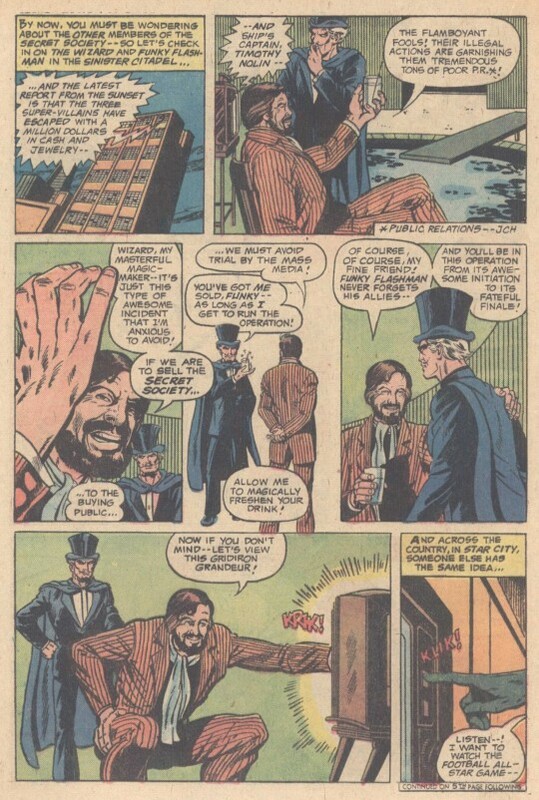 First are the Wizard and Funky Flashman, who have been a running plotline these past few issues. The moment is really nothing more than reminding readers of who they are, as they play no further role in the proceedings. But at this point, Funky is both looking and sounding a bit more legitimately like Stan Lee. 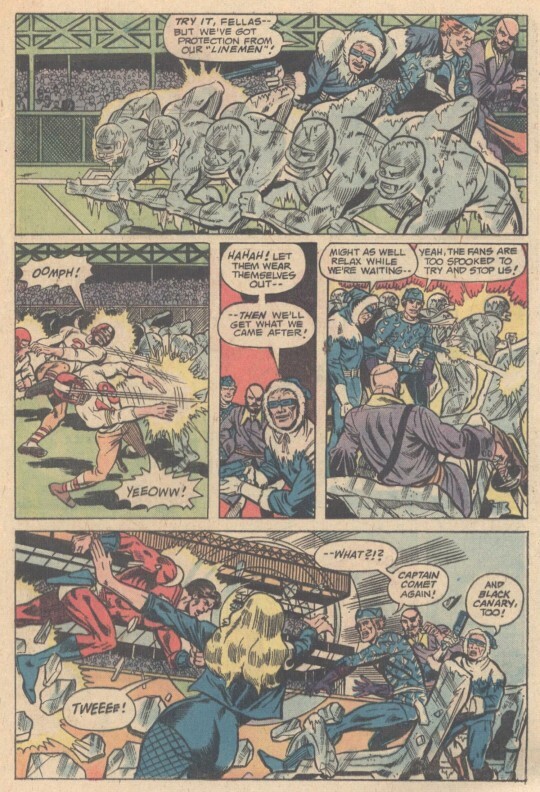 The other spectators are Green Arrow and Black Canary, who are being visited by Captain Comet in Star City. When he last encountered the Captain Trio, his telepathy picked up an impression of Star City and so he figures it’s the criminals’ next target. Green Arrow is his typical abrasive self and refuses to help, but Black Canary goes all-in with Captain Comet. Good thing, too, as the three villains next attack Star Stadium, where they’re after the captain of the Star City team. Captain Comet and Black Canary make the scene, and it becomes a free-for-all, one that also involves the players. Stingaree once again tries to use the captive football captain as a shield, but Comet isn’t having any of it and knocks him flat. But as they mop up, Comet’s telepathy picks up an impression of the other two captives of the villains, strapped to a giant metronome that lowers the temperature surrounding it with each passing tick. The two men are in dire jeopardy. In order to save them, Comet uses his mental powers to slow down all of the machine-works in the area, giving Black Canary enough time to locate them. Which makes you wonder, if he can do such a profound thing, why doesn’t he use that ability in battle more often? But no matter. 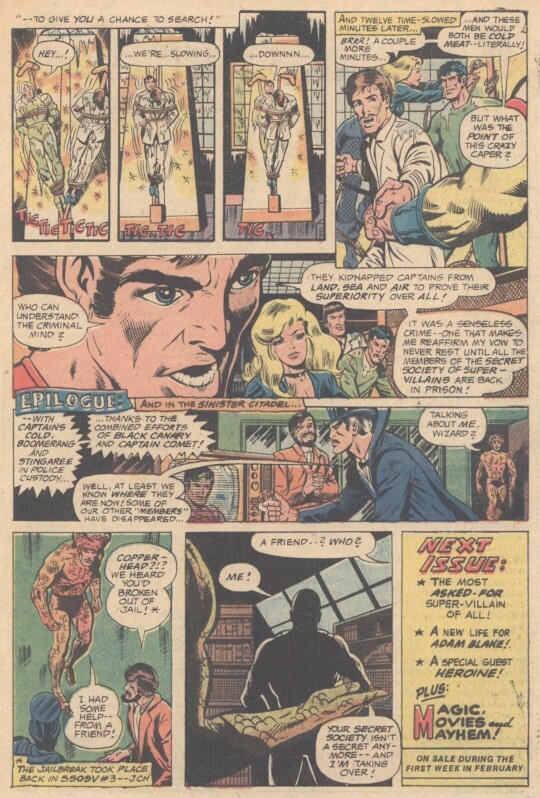 In the wrap-up, the heroes comment on the fact that the villains’ plan makes absolutely no sense, a moment of very strange self-awareness on the part of either scripter Bob Rozakis or the book’s new editor Jack C. Harris. And the issue closes out back with the Wizard and Funky watching the wrap-up, only to be interrupted by the return of Copperhead and his shadowy benefactor–who declares that he’s taking over the Secret Society! Who could he be? We’d need to wait for the next issue to find out.